Various converters online can help you convert PCL to TIF and fit to paper size. This article recommends VeryPDF PCL Converter for three reasons: first, as its name tells, it is a professional PCL converter. Secondly, it supports lots of output settings such as paper size setting. Thirdly, it’s easy to use and runs well without any third party applications. 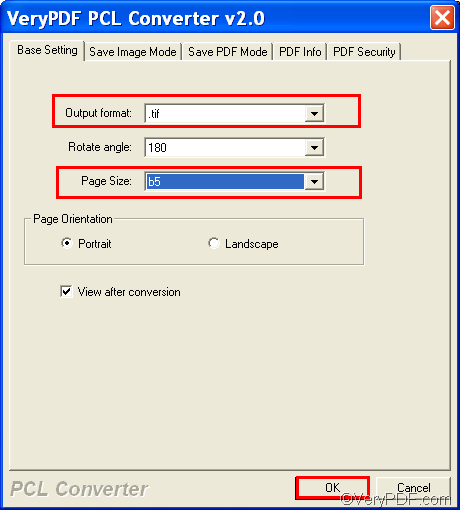 Try VeryPDF PCL Converter now? Please click here to download it. Install it on your computer, and follow the four steps to convert PCL to TIF and fit to paper size. You can run the GUI application of VeryPDF PCL Converter by double clicking its shortcut icon on the desktop. Then main interface of VeryPDF PCL Converter is as the following illustration, which contains a list box, a tool bar above the list box, and a button bar under the list box. There are three ways to input PCL files. For example, you can click Add File(s), > select the PCL files you want to covert in the dialog box that pops out, > click Open in the dialog box. If you want to input a folder, you can click File on the toolbar over the list box, > click Add directory…> select a folder in the dialog box that pops out, > click OK in that dialog box. When you can view all the added PCL files in the list box on the main interface, you can go to set the options. 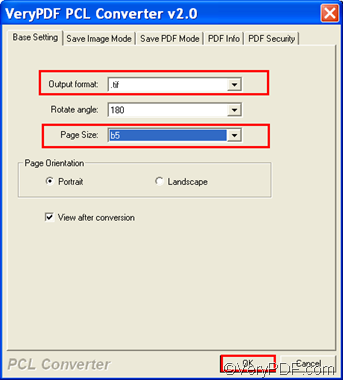 Please click Setting to open the setting dialog box, > select .tif from the Output format list, > select a proper paper size such as b5 from the Page Size list. > click OK. Please click Start on the main interface, > select a folder in the dialog box that pops out, > click OK. The computer will prompt to convert PCL to TIF and fit to paper size, and automatically save the result TIF after conversion. How to convert PCL to TIF and set page orientation? This entry was posted in VeryPDF Blog and tagged fit to paper size, PCL to TIF. Bookmark the permalink.